June 1, 1916 Go aboard the train Bands playing, people cheering. Engine decorated with flags. June 2, 1916 Have another engine put on the rear of our train. Wood fuel one. Very slow travelling. Going through forests. June 3, 1916 Dinner at Vologda. Getting hot in the day. Pass Danilof. Ed. Note: Danilov not marked on the above map. Crowds of people to see us on every station. We are told not to pipe down as there is a feed waiting for us at Jaroslav, but we do not arrive there until 7 am. 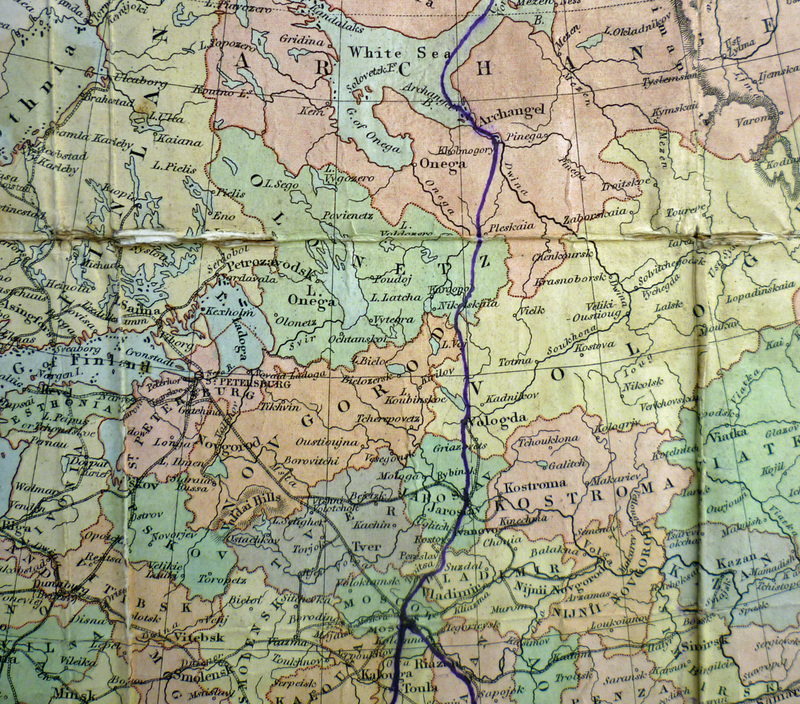 June 4, 1916 Getting nearer to Moscow. Again we have to sit up until 3 am and when we arrive a good number of people were sleeping. Russians bring us soup in bed. June 6, 1916 Go into city. Everybody looking at us. Cannot stand still as a huge crowd gathers round us and feel our clothes. Terribly hot. Meet two people who speak English, and go home with them. June 7, 1916 See our friends again and go shopping. Visit a music shop where the ‘Old Boy’ plays all the English tunes he has on the pianola and gramophone and we have to sing Tipperary. Go to a nice cafe for dinner and in the afternoon see the Kremlin, Big Bell Czar’s Chapel, Ball Room, Throne, etc. June 8, 1916 March through the city to English Church with the band leading us and Cossacks each side. Flags out people cheering and throwing flowers to us as we pass along. Terribly hot, fellows dropping out as we go. Have a service in the church and then have to march back to the station. June 10, 1916 Have a bathe while the train is waiting. June 12, 1916 Very nice country. Heaps of flies and mosquitos. Have a swim in the Don. One of our fellows drowned. Arrive at Rostov. Grand reception. Lovely town and people. March through the streets strewn with roses to open air gardens. Have a swell feed which was provided for us by the people of the town. Sit in open air theatre and hear ladies sing and see a lot of Cossack dances. Given cigarettes and march back to train loaded with flowers. June 14, 1916 Arrive at Vladikavkas in the Caucasus where a Cossack band leads the procession to the Kardetski Korpus, a fine boarding college for officers, 5 miles away. Have a good wash and then get on the trams which were decorated for the occasion and are taken to the Banqueting Hall. After leaving that and feeling happy and contented go into the park and on the lake in boats. June 15, 1916 Sleep in sheets for the first time since leaving England. June 16, 1916 Review by a Russian General. Very hot, can see Mount Kasbek in the distance with snow on its peaks. June 18, 1916 Terribly hot, nearly every one sick. Hospital full up with dysentery cases. June 23, 1916 Bendixen dies of dysentery. I go to the dentists. June 25, 1916 Funeral, I am one of the firing party. June 27, 1916 Go for a route march in our shirts and shorts. July 3, 1916 Put up a marquee for the Sick Bay. July 8, 1916 Go for another route march and sleep out the night. July 9, 1916 Our fellows give a concert in the Theatre for Red Cross. July 10, 1916 In hospital. On low diet Breakfast, two cups of che. Dinner, one plate of soup. Tea, egg and milk. July 14, 1916 Mail arrives, great excitement. July 17, 1916 Out of hospital. Sea Base Arrive. Firing practice with 3 PR. Johnson dies. July 26, 1916 Working hard. Getting ready for moving. July 27, 1916 Up at 4 am. Work until 1.30am the next morning. July 28, 1916 Up at 3am. 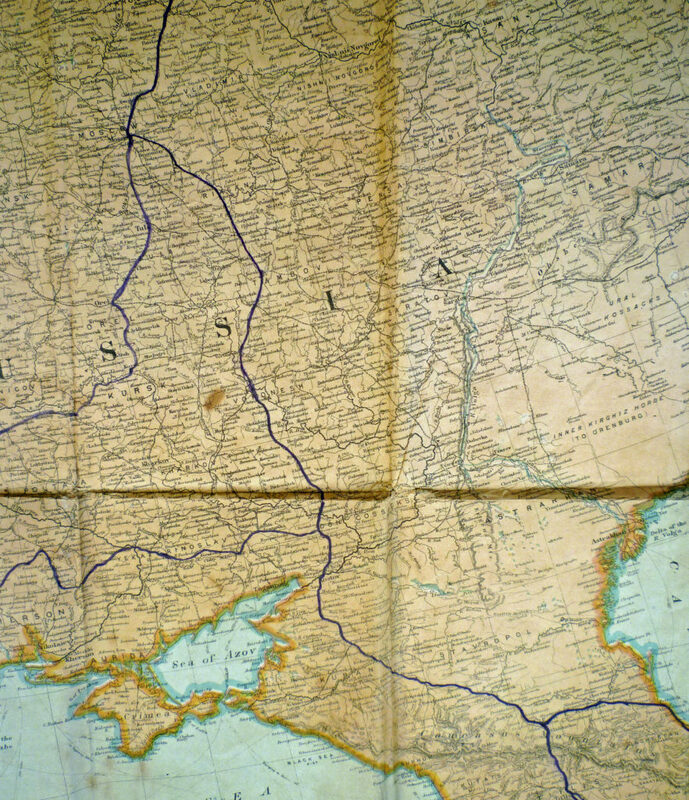 Leave Vladikavkas in Lanchester car and start to cross the Caucasus. Very dusty. July 29, 1916 Spend the night out again. Thunder storm at night, get well moistened. July 30, 1916 On our way again at 3.30 am. Get soaked at night. Everything wet. Ring our clothes out and put them on again. Feel miserable and cold. Pass through Tiflis. Beautiful town. Stay outside town a short time to dry out clothes and blankets in the sun. 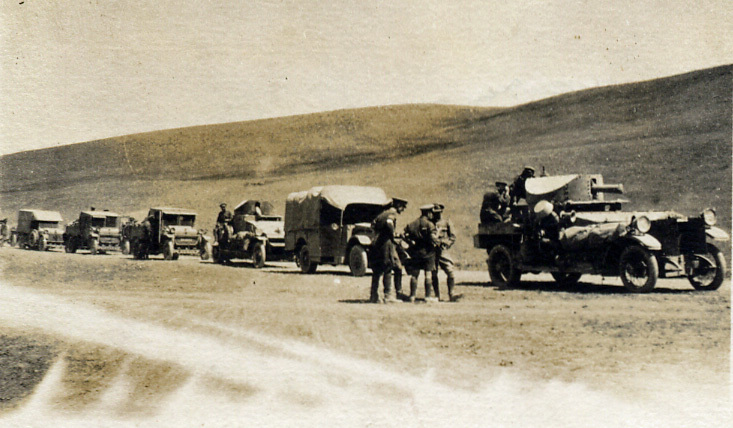 July 31, 1916 Arrive at Alexandropol and then proceed to Kars. Aug 1, 1916 Go to town in Drovski. Change tyres on car. Aug 3, 1916 Leave for Sorakimish. Over mountains at time going through the clouds. Travelling on a Pierce Arrow lorry with trailer. Aug 4, 1916 Reviewed by the Grand Duke Nickolas. Prisoners sweep the fields for him to walk over. Terribly hot. Aug 7, 1916 Sunday Have a picnic in the evening with six Russians, make a late night. 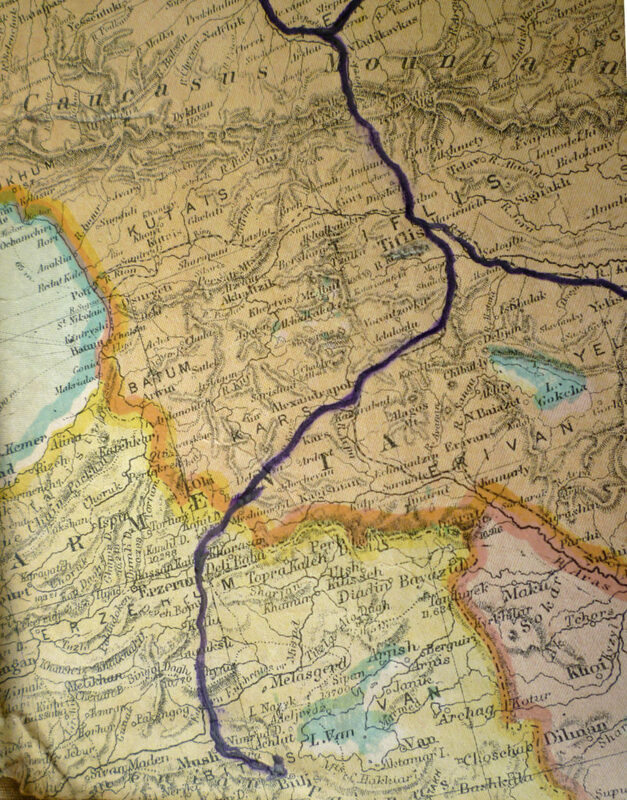 Aug Monday, 1916 No 1 Squad leaves Sorakimish for the Turkish front. Do some washing in a stream. Aug 13, 1916 Mail arrives from England. Heaps of eatables. Aug 17, 1916 Leave Sorakirmish for Turkish front. Rains hard all night. Sit up all night as we have nowhere to go for shelter. 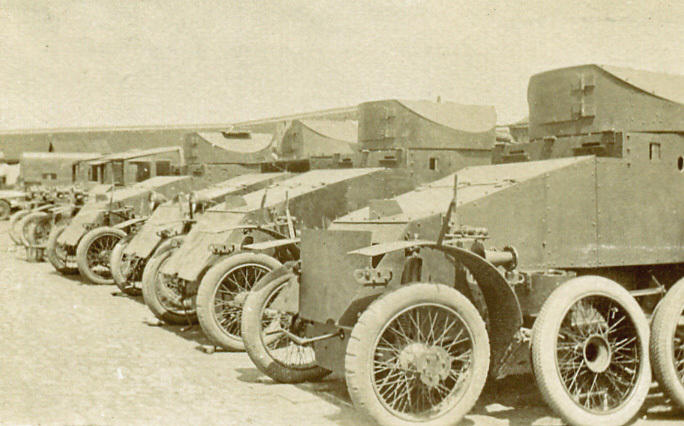 Aug 18, 1916 Commence our journey again on the heavy lorry with 3 PDR on a trailer fastened behind. In Asia Minor. Aug 20, 1916 Terrible roads. Have to pull the cars up hills. Piles of dead horses, camels, etc lying by the side of the road. Aug 21, 1916 Arrive at Charboury. Cannot bear our hands on metal parts, being so hot. Aug 22, 1916 Have a bathe in the Euphrates. (see Map) Crossing fords with the lorry. Sept 1, 1916 In action against the Turks and Kurds at Kascoin with our 3 PDR gun. Sept 2, 1916 Move on again towards Bitlis. Some fellows wounded. Sept 4, 1916 In action again, Shell Turks out of a village and then the Russians set it on fire. Running short of food. Black bread and che for breakfast, dinner and tea. Sept 9, 1916 At Mosack. Fire 160 shells. Hit a Turkish ammunition dump and kill many. Russian General congratulates us on the good work done. Sept 10, 1916 Returning from the front owing to rainy season. Pass Musk and have some good feeds from the vineyards. Sept 11, 1916 Lorry falls through a bridge near Kennis-hola. Spend the night in an aeroplane tent. Sept 20, 1916 Arrive at Kars. Mail arrives. Sept 22, 1916 Go to Russian Funeral Service in Church lasting 2 hours and standing up all the time. Oct 17, 1916 Leave Kars in trucks for Roumania.